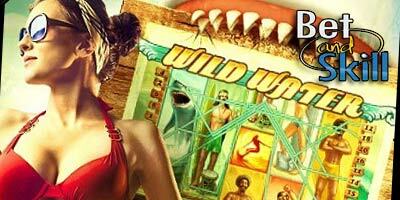 Wild Water is a brand new video slot, produced by software developer Net Entertainment. This game takes players back to the beaches of the 60’s and 70’s when beach bums ruled the waves. Play Wild Water slot machine for free here, get amazing free spins offers and no deposit bonuses! Stanjames - 5 free spins - no deposit required! This is a 5 reels, 3 rows game with 20 fixed bet lines. The Surf Team bonus win is triggered when all 5 different stacked surfer symbols appear and pays a massive multiplier of x200. Another exciting feature is the Surf´s Up bonus which rewards players with a x20 multiplier. Wild Water™ is a 5-reel 20-bet line video slot featuring Wild substitutions, Free Spins, stacked symbols and special Surf Team and Surf's Up bonus wins. The game is played with 20 bet lines (fixed), bet levels 1-10 and different coin values. All coin wins apply to bet line wins, Surf Team and Surf’s Up bonus wins only. In both the main game and Free Spins, surfer symbols appear as stacked symbols on the reels (see paytable page 4 for surfer symbols). A stacked symbol is a symbol that either partially covers a reel (1 or 2 positions on a reel), or covers all 3 positions on a reel. Stacked symbols will be fully or partially displayed depending on how the reel lands. Any part of a stacked surfer symbol included in a winning bet line pays according to the paytable. In both the main game and in Free Spins, Surf Team and Surf’s Up bonus wins are activated when any combination of all 5 surfer symbols or all 5 different surfer symbols appear on all 5 reels. All 5 different surfer symbols appearing as stacked symbols of 3 on all 5 reels pay the current bet x200. Any combination of 5 surfer symbols appearing as stacked symbols of 3 on all 5 reels pay the current bet x20. Surf Team and Surf’s Up bonus wins in coins is equal to the current bet multiplied by the applicable bonus win multiplier (x200 or x20). Surf Team and Surf’s Up bonus wins in currency is equal to the win in coins multiplied by the coin value. A Surf’s Up bonus win cannot be won simultaneously with a Surf Team bonus win. Bet line wins are added to any Surf Team and Surf’s Up bonus wins. Wild symbols can appear on any reel in the main game and in Free Spins and substitute for all symbols except Scatter symbols. In Free Spins, Wild symbols automatically expand to cover the entire reel they appear on if resulting in a bet line win. Wild symbols cannot substitute surfer symbols to complete Surf Team or Surf’s Up bonus wins. The number of Free Spins won is according to the PAYTABLE. TOTAL WIN displays any wins during Free Spins added to any wins from the round that activated Free Spins. At the end of Free Spins, the game returns to the round that activated Free Spins. "Wild Water slot - Free Play - No deposit bonus - Free Spins "